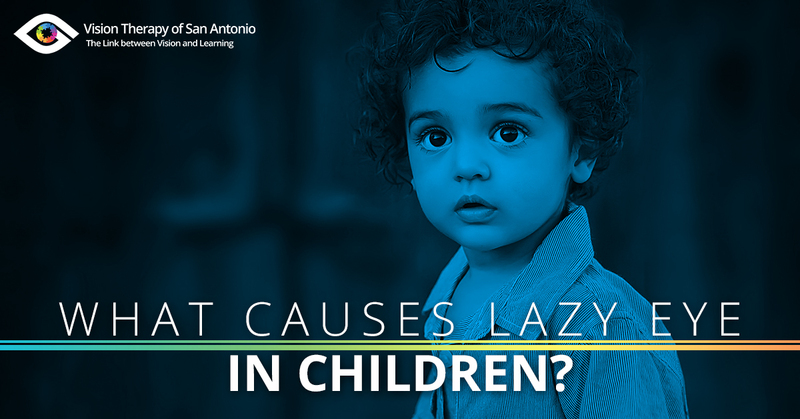 Four percent of children are born with Amblyopia, commonly called “Lazy Eye.” Though the disorder does not harm your child physically, if left untreated it can lead to serious problems such as learning disabilities, double-vision, and even blindness. Amblyopia is caused while your baby is in utero. It commonly happens when the eyes develop improperly. This sight disorder can also occur hereditarily. Meaning, if you or your spouse’s family has a history of lazy eye, your baby runs a risk of inheriting the disorder. However, your child could also be born without any lazy eye symptoms, yet show them later in childhood. This can occur when the nerve pathway from the eye to brain has not developed properly, creating vision problems in an infant or a child. No baby is born with 20/20 vision; sight, much like everything else, is developed over time and refined with practice. This “practice” occurs when a child uses both eyes to identify an image, allowing that image to make contact with the thin layer of tissue located in the back of the eye, called the retina. This process is sharpened from infancy to the age of nine. It is important to treat amblyopia before the age of 10. Once a child is older, the effects of amblyopia are almost impossible to correct. However, when the child is younger and the eyes are still developing, they can be easily trained to restore perfect vision. Strabismus occurs when the eyes are misaligned. Eye misalignment is the most common cause of amblyopia, as the misalignment directly affects a child’s visual perception. When both eyes are not aligned in the same direction, a child’s developing brain cannot process images and thus “turns off” the featured image. This is the brain’s way of protecting itself from confusion and double-vision. Because of this, vision is shifted from both eyes, to only one eye. A growing child will then develop to be one-eye dominant. If your child shows clear signs that he/she is using only one of their eyes, you must take action to correct it as soon as possible. If the misalignment continues to be untreated for as little as a few weeks, “the eye will not connect properly to the visual cortex of the brain.” This misalignment results in the development of amblyopia. Lazy eye treatment can be a long process, however surgery, patching, and vision therapy have been known to be effective. Anisometropia is the scientific name that describes when there is an unequal refractive error in a child’s eyes. If the refractive error is not the same in both eyes, then both will not be able to focus at the same time. Amblyopia is more likely to occur in the eye that has the greater amount of refractive error. It is the eye with the greater error that normally becomes dormant, as the child will use the better eye to focus out of. However, anisometropia is often not something you can visibly see in a child. Often, a vision test must be administered at the ages of six months and three years. Both of these tests will conclude whether your child has a risk of developing amblyopia. Though difficult to detect, anisometropia is easy to correct. Normally glasses, contacts, and part-time patching the better-focused eye can help treat it. Deprivation means that there is an obstruction or cloudiness of the eye tissue. When there is a cloudiness of eye tissue, this directly affects whether a child can see clear images. When clear images cannot be seen, this prevents the image from reaching the retina and can lead to the development of amblyopia. This is by far the most serious of cases where amblyopia develops, yet also extremely rare. There are several types of deprivations: cataracts, cloudy lenses, cloudy corneas, and eyelid tumors. Each of these can affect a child’s vision, which will develop into amblyopia. As these are also difficult issues to detect in a child’s behavior, it is important to test your child for eye-related issues so treatment can be applied swiftly. It is important to know and understand the importance of having your child’s eyes checked. Even if they behave normally, there might be an underlying issue with their sight. That is why it is so important to test their eyesight to ensure they can receive treatment before the issue becomes permanent. If your child is diagnosed with amblyopia, you have many different treatment options to choose from. However, for children, vision therapy is the easiest way to practice proper vision. At Eye Therapy San Antonio, your child will be given a series of fun exercises to improve their eyesight. Through our services you and your child can find a fun and easy road to recovery, without the need of an expensive surgery. To know more, contact us! We can answer any questions you have about the effectiveness of vision therapy!